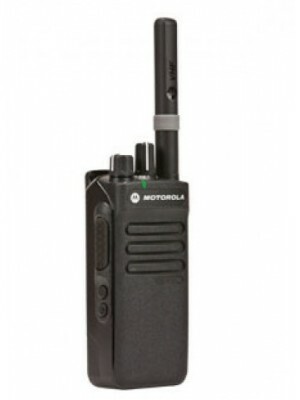 The Motorola new generation of digital two way radios have arrived. The DP2000 series offers best in class audio, 40% longer battery life, and durability that is second to none. The Motorola DP2400 digital radio is perfectly suited to harsh environments such as construction and manufacturing, where day in day out durability is a must. The DP2400 two way radio is interoperable with analogue technology meaning you can migrate to digital in your own time. This radio features Lone Worker as standard ensuring staff are monitored at all times. It also features intelligent audio meaning the radio volume automatically adjusts to compensate for background noise. The ability to make and receive private and group calls means you can communicate with radio users without disturbing others. The DP2400 is a non-display radio featuring a 16 channel capacity, 3 programmable buttons and is available in UHF & VHF, with a battery life of 11.5 hours in digital mode.